The Elora Farmers Market is a place I love to visit, both summer and winter, because the produce and other food is always so incredibly delicious. Taste is a great reason to eat local and organic. By taste, I mean that the produce tastes as one would expect it to. The supermarket food looks lovely, but it has no flavour. Most food at the Elora Farmers Market is locally grown, and often fresh picked. That’s where the taste comes in. Food that is grown to be packed for a long trip must be sturdy, and often unripe – to be gas ripened on its journey. Yuck. I was raised on homegrown garden food. I know what my veggies should taste like, and I’m fussy. Yellow Plums From the Elora Farmers Market. Often my Saturdays are very busy and the folks at the market have packed up and gone home before I can get there. This past Saturday I organized my trip to Bissell Park early enough to get plenty of tasty goodies. I ate my coconut tart while I was there, and we were only a block from the market before my son sampled the yellow plums. Our main goal was to find tasty treats to cook as part of the inaugural meal for the new barbecue. Trust me, it was difficult to choose. There’s something about an open air market that makes me want to buy everything, but one can carry only so much. Choices had to be made. The vendors were all so very knowledgeable regarding their produce. It’s wonderful to speak to the people who grew the food. They are proud of their produce and know so much about it. We got some excellent grilling advice from the fellow who sold us a small zucchini, and had never considered sprouting peas. They were delicious, by the way. Silly me. I know better, but I decided to look on after viewing some strawberries that I wanted to buy. I was worried about crushing them. All were sold by the time I returned to the booth. No berries for supper. We had plums and peaches, so were still okay. Potatoes, corn, zucchini, sausage & lamb from the Elora Farmers Market. After much chatting about gardens, trees and food, and best ways to eat various items, we headed home weighed down with two bags full. The inaugural barbecue dinner was a small feast of corn on the cob, grilled zucchini, lamb tenderloin, pork sausage, and new red potato wedges. Even the blueberry barbecue sauce came from the Elora Farmers Market. It was a fantastic meal served with garlic flatbread, also from the market, and washed down with a county brew. My refrigerator is full of other yummy things, such as carrots, peaches, plums, and leftovers from Saturday’s meal. Add the tasty morsels from my garden, and we’ll be eating well this week. My schedule may not allow for a market visit this week, but I’d love to go. Having a market in Bissell Park, along the Grand River is a wonderful idea. The open air is good for us all. The food seems so much better in this natural setting. It’s a nicer visit for families, too. Children can run and play while parents shop, instead of being jostled in a crowded building. Last Saturday was a great day for those who love to transform themselves into pirates with a bit of face paint. It was just one of the many fun extras for market-goers. The Elora Farmers Market is open in Bissell Park off Mill St. E between Melville and Mary Streets. Hours are 9am to 1pm on Saturdays. Bissell Park is the summer location from May to mid-October. The winter home is in the Paddocks building at the Grand River Raceway. 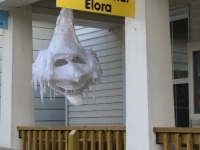 Learn more about the Elora Farmers Market by visiting their website or by calling (519) 341-1860.